This week's Iron Craft Challenge is Button Up. I start out on Thursdays with all these possibilities, intending to do more than one thing each week. Then reality hits and it's pushing me to be able to get ONE thing done. This week I was going to create bookmarks this week and crochet a bracelet in addition to the bracelet that I actually managed to complete, but I never made it that far. Apparently getting the glue gun out is too much LOL. 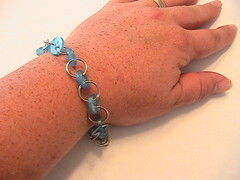 I actually ended up making a bracelet. 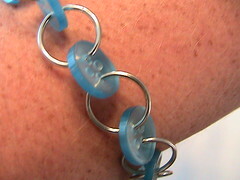 This was actually very simple to make, I just connected the buttons with jump rings and used a clasp to close it. Very easy! I found my button collection rather limiting for this challenge. I think I'm going to be keeping an eye out for buttons at garage sales and thrift shops. While I was doing this I ran across a button bracelet that I made back when I was younger and in my Laura Ingalls Wilder phase. The one I made this week is quite different! I'm not the most green person in the world. Don't get me wrong, I DO recycle and try to reuse things before tossing them, but I don't allow a product's packaging to influence my decision to buy it. One of the green things I do though is try to keep the waste from my daughter's lunch to a minimum. 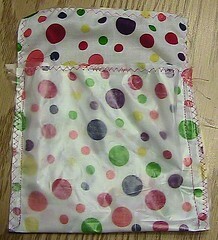 I've sewn several cloth lunch bags, we use a thermos for her drink, a cloth napkin, a heavy reusable plastic utensil and I've made a few cloth bags for the stuff inside the lunch as well. I've been needing to make a new sandwich bag. So, when Iron Craft announced Challenge 28: Reuse, I knew right away what I was going to make. I don't have dimensions right now but the fabric was about 7 inches by 16 inches, it was a scrap left over from another project so it wasn't cut straight, but it didn't really impact how this turned out. 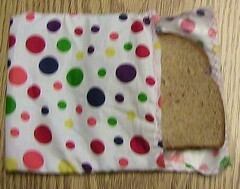 Lay the fabric down and place the bag from the cereal over top. 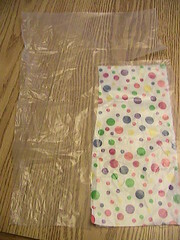 Trim the bag to be the same size as the fabric. Next, sew the two pieces together. 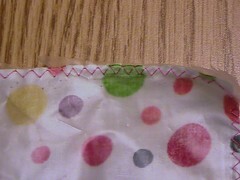 I just did a zig zag stitch around the outside edge. Then, fold the bottom up with the fabric sides together so that the bottom edge is about 2 inches from the top and then sew (using straight stitch) along the sides. Now, you're ready to turn it right side out and start using it! I've washed the other one when it got particularly messy in the washing machine and it's held up pretty well for two years. I just tuck the open end down in the bag once the sandwich is in there to close it. You could use velcro if you wanted. For more great tips check out We are THAT Family and their Works for Me Wednesday post. 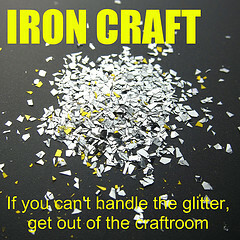 For more great crafts that reuse, check out The Iron Craft flickr pool. What do you do to reuse? This week's Iron Craft Challenge is Stars and Stripes. 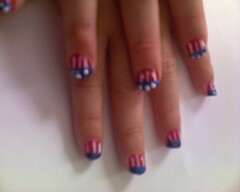 I decided to do the obvious and go with the patriotic theme and actually did two things this week. 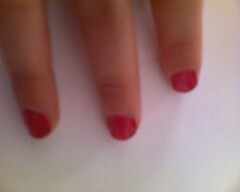 We started with a plain coat of red. 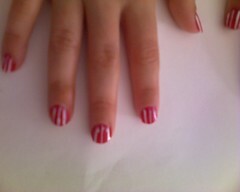 Then we took some white and drew on some stripes. 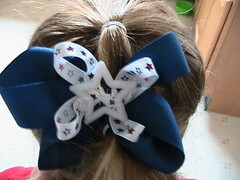 Then, we painted the tips blue and followed that with some white dots for stars. In between each step, we left the paint dry well. 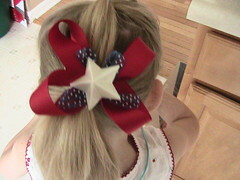 For this challenge I also created some new hair bows for the girls to wear. In the center of each one I put a star shaped cupcake topper (I trimmed off the pick part).